Hello! I am excited to share with you my entry for the Modern Mini Quilt Challenge at Ellison Lane Quilts. I have been working on this relatively little quilt for a few weeks now; many, many naps times later this is what I ended up with. 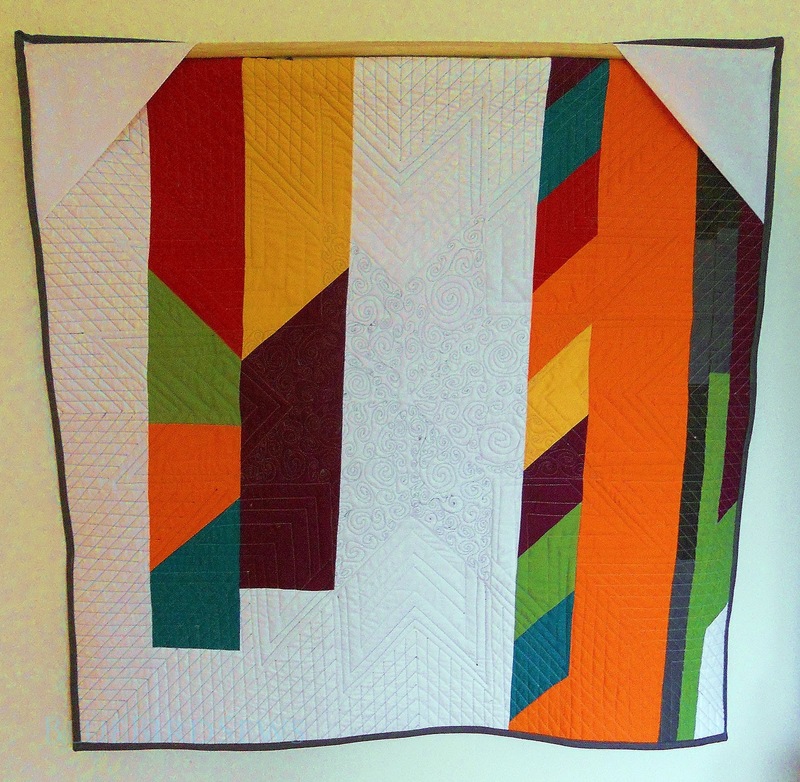 Little isn't necessarily fast in quilt land! 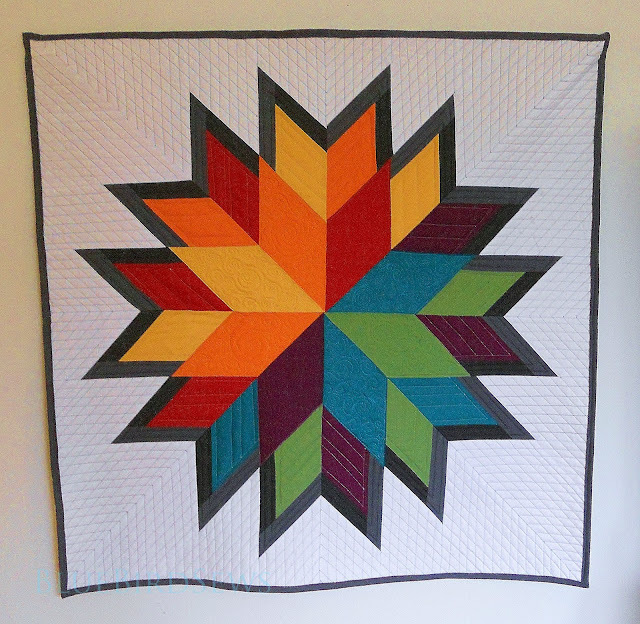 This quilt started with a Lone Star pattern, but turned into something so much more. I wanted to try out the pattern and audition colors for a quilt for my bed. I am still undecided as if this will be 'the one' but I am sure glad I tried it out on a small scale before attempted 7x7 rows of diamonds! The colors I used were from all different fabric lines and it was really fun mixing and matching. The quilting pattern came rather organically. 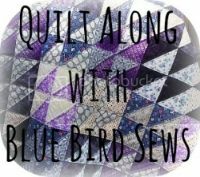 I had a plan for straight line quilting the back ground with small lines and then decided to take it to the next level and make it all diamonds. The swirls in the center remind me of the center of a flower with petals on the perimeter. This whole quilt pushed my comfort zone. First time working with diamonds; which gets easier as you go (just make sure the seam ripper is near by!). First time just winging it from start to finish not really knowing what this quilt was going to look like in the end. Pushing myself was rewarding...I am really happy with it! The back is the left over scraps, i just love the row of diamonds, that is my favorite! The quilting looks as cool from the back as from the front. The quilt measures 33"x33" just under the requirement. One night while in the middle of making this I had a panic moment wondering if it was too big to be a mini...thankfully the cut off is 36"x36", whew! Thanks for stopping by! I am so grateful to have finished my quilt in time and for the opportunity to enter into this amazing contest filled with so many beautiful quilts (and amazing prizes!) Competition is stiff, so wish me luck! Wonderful job on this!! Fantastic!! Love your colors!! Your mini is really striking - what an impact! You did a wonderful job. I really like the edging and binding in the grays. It is such a nice complement to the rainbow of colors! Hi Kelly! I knew you are up to something special and so you were! Your quilt is just so beautiful and fantastic! Thank you for your support on my mini! I bet you have good chances to win. It looks great! I like the shading on the outer diamonds. They definitely aren't an easy shape to assemble on the first try. This is one of my favorites so far. Well done, it's gorgeous! This is so impressive! You did a great job! Love the pattern and the colors! 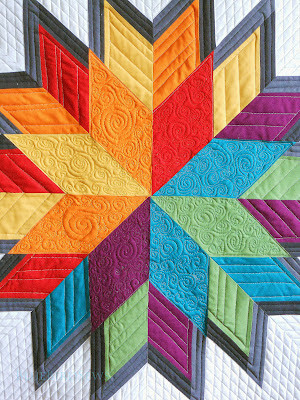 That is eye catching and I love all the detail in the quilting and the colors selections! Great job! Hope you win. Oooh, I LOVE this Kelly! 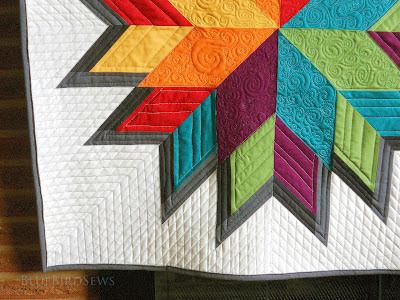 The colours are amazing and the quilting lines really make it. Beautiful work! This is gorgeous! Good luck! I love this! The colours, the design, the quilting, the back....everything! The quilting is exquisite! I agree that little isn't always quicker. Congrats on a great finish! ouuuuuuuing and ahhhhhhing over this one!! love your color choices! Wow - your quilting is absolutely amazing!!! Such a stunning quilt!! 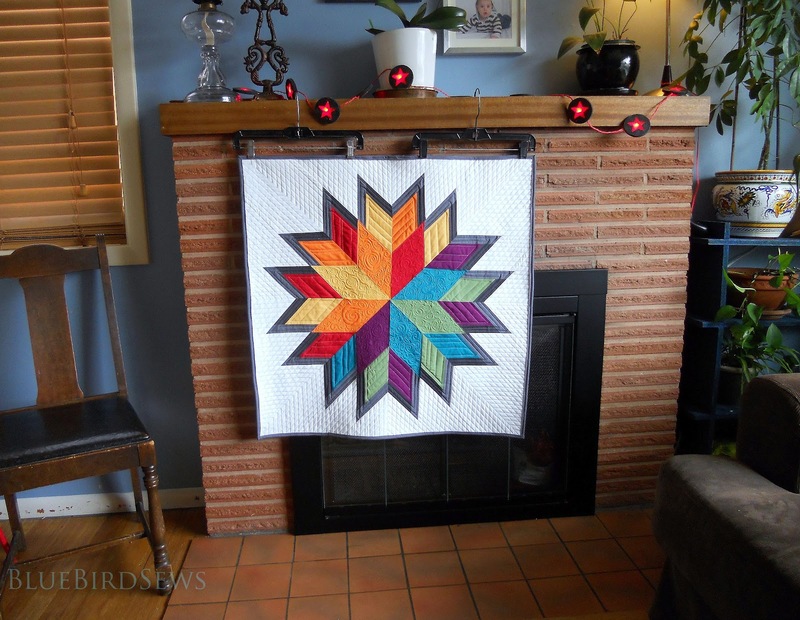 This quilt is beautiful and I love how you quilted the middle. I voted for this one! It's just beautiful and I love how much you learned! It's beautiful! The quilting really shows up. You did a great job! Gorgeous mini!! 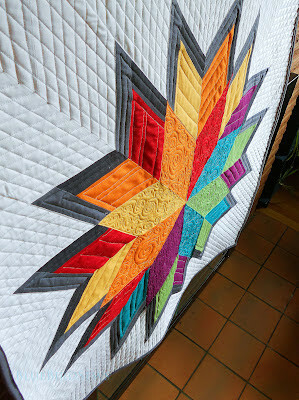 I love the quilting you did on the stars. This is so great! I love the bold colors! Good Luck on the contest! You made a beautiful quilt that's for sure. Very colorful and fun. Beautiful in all it's color/design! absolutely stunning, from design to color to quilting!